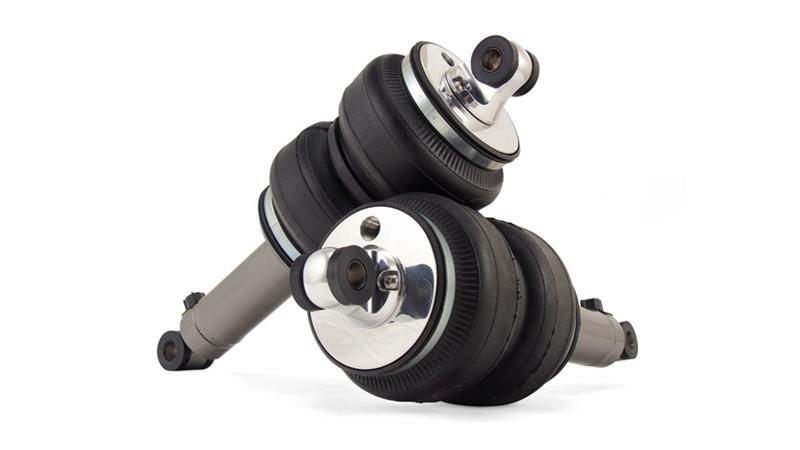 Air Lift SlamAir Shocks are the perfect coilover shock replacement for hot rods. SlamAir® Shocks are a value priced alternative to coilover suspensions for your custom application. Our performance air shocks get you the lowered look you crave and the safety and reliability you need. Used primarily for FRONT suspensions, the bellows style bag has a higher load capacity than a sleeve style. Using Air Lift brand air springs allows for a higher pressure rating, and the best warranty in the industry. Air Lift air springs “balloon” less under pressure, keeping the max. diameter to only 7.0″. Used primarily for REAR suspensions, a sleeve style bag keeps the spring rate down to improve the ride quality. Using a tapered piston sleeve style bag, we’re able to create a progressive spring rate similar to a high end coilover. By tapering the piston and not the bag, we can keep the max. diameter to only 5.1″! 9-way adjustable damping, end mounts, and optional inverted mounting are just a few ways SlamAir Shocks can help you customize the look and ride quality of your truck.